A Soldier of the Great War is a very different kind of World War I novel. Sure there is fighting and people die, as Helprin’s novel shows slices of the Italian action in World War I, on the mainland and mountains, on the sea, and in Sicily. But the primary focus is a lingering portrait of a man named Alessandro Giuliano who reflects back many years later on a life which has been horribly distorted and largely wasted by the experience of war. We meet brave men, loyal comrades, confused leaders, an absence of purpose and integrity, significant corruption, and a total lack of ability to control the outcome. This is mankind’s repetitive experience of meaningless killing. Helprin presents it in a way you will remember with compassion for Alessandro and a greater understanding and some contempt for many others whose actions were far less meritorious. This is a book which starts slowly and you might be tempted to quit. I urge you not to. There are a series of pre-war scenes, establishing the relationship between Alessandro and his father, providing poignant views of what his privileged life might have been if not interrupted by the war. We see early on what an excellent observer Alessandro is and begin to anticipate how his sharp humor and sense of irony will illuminate the dark experiences he is soon to have. A very sweet aspect of Alessandro’s tale is that he tells most of it to an uneducated but curious young man he finds on the road and hikes with for several days. The relationship between these two men and the patience of the older for the younger add a great deal to the book’s enjoyment, serving as intermezzo between recollections. Having survived the war and forsaken other career options, Alessandro became a professor of aesthetics, seeking beauty as a contrast to the ugliness he has experienced, permanence as opposed to the always truncated love he has felt for those who died too soon. He is far too cultured a man to imagine him killing other people, but the needs of war, of course, take no cognizance of people’s real talents. Helprin’s writing technique (in this book and in Refiner’s Fire, which I read a year or so ago, and also recommend) is to present a sequence of what may seem to be unrelated tales in the life of a single character. Some may find this disconcerting, at least in the beginning, but as you let yourself accept Helprin’s flow, it all seems to work. The transitions, or more often absence of transitions, reflects how it must have been to be wrenched from one life to another. The war scenes are nothing like Remarque’s “All Quiet on the Western Front” or Junger’s “Storm of Steel,” because everything is seen through the eyes of a seeker of beauty who does not succumb to horror even as he is unable to make his many small triumphs amount to more than a shadow of the life he had envisioned; there is always another senseless challenge. I wondered if Alessandro would ever express the frustration he must have felt, but he just kept “soldiering” on, even as the goal if there ever was one kept receding faster than he could approach it. Helprin’s ability to describe places, things and people is extraordinary, something any writer can learn from. The mountain climbing scenes in particular are marvelously frightening. A mild criticism is that he is so good at description he may do it too often and in too much detail. There were times when I wanted to know what happened to Alessandro and was frustrated by yet another descriptive diversion. But having said that … the overall impact of the story is so very good, thoughtful, entertaining, enlightening, and of course sad. Alessandro’s musings about death, finally facing his own while remembering all the others he has seen, are by themselves worth the read. The best evidence, he hopes, of some future after death is contained in the hints of a past before birth. There’s a thought that will stay with you. This entry was posted on March 25, 2012 at 11:07 am	and is filed under *** Lew's reviews - general reading. 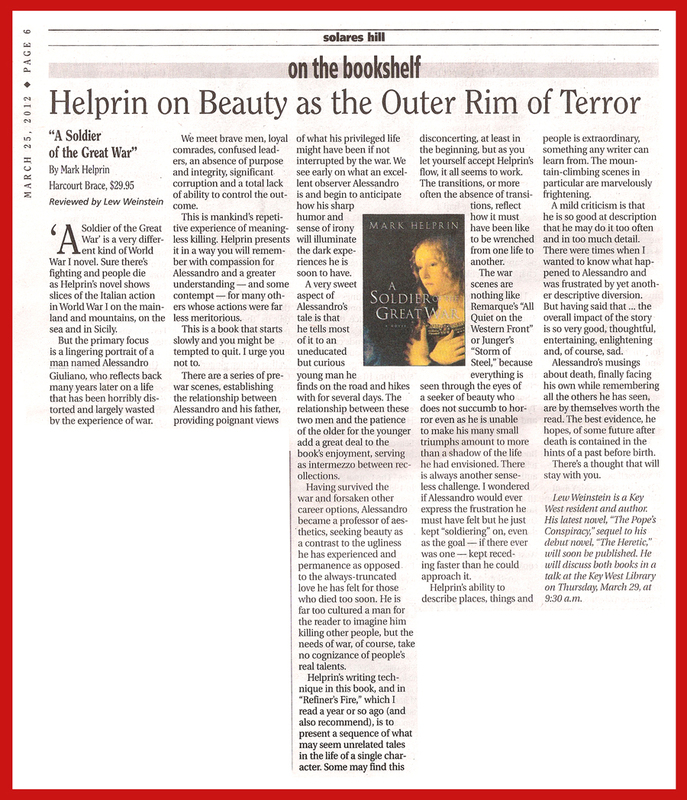 Tagged: A Soldier of the Great War, Lew's review, Mark Helprin. You can follow any responses to this entry through the RSS 2.0 feed. You can skip to the end and leave a response. Pinging is currently not allowed.